Almost all of us sit too much every day. Here’s what you can do about it. 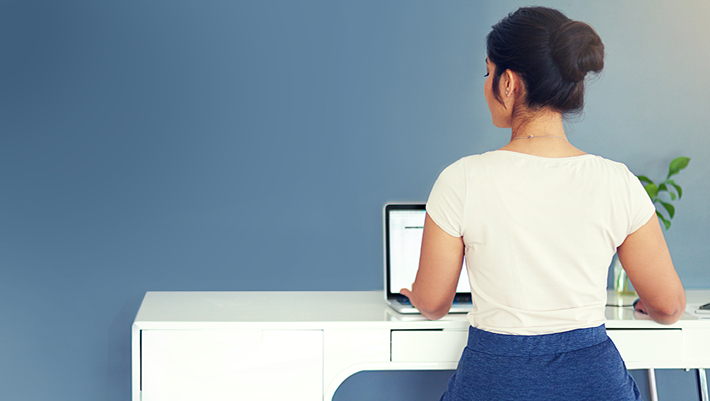 Whether you’re at work, at school, in transit or at home, your backside spends most of the day stuck in a chair (for some of us, up to 13 hours). And as you’ll see below, even if you’re a regular exerciser, that much sitting can chip away at your health. Don’t panic, though. Just get up. We’ve got some ideas that can help. “If you sit a lot, you have twice the risk of developing type 2 diabetes and cardiovascular disease, or of dying from cardiovascular disease, compared to people who don’t sit very much,” says Genevieve Healy, senior researcher at the University of Queensland in Australia, who’s studied the health impacts of prolonged sitting. High levels of sitting have also been linked to weight gain, depression, and even some cancers. Although Healy’s research hasn’t determined exactly how much sitting is too much, she says it’s not just the total amount of time but also long, unbroken bouts of sitting that are particularly damaging. And don’t think you’re off the hook if you exercise regularly. If you’re sitting the rest of your day, you’re still at risk, she says. Fortunately, there are easy ways to sit less and move more. Here are seven good ideas to make it happen. Snag the furthest parking spot. If, like most Americans, you drive to your job, you’ve just spent the last several minutes (or more) sitting on your duff. So give those legs a little stretch by parking your car as far from the entrance as you can. If you ride a train or bus to school or work, leave a little earlier so you can get off a stop or two in advance and hoof it the rest of the way. Start your day on two feet. Many workplaces are investing in adjustable-height desks for employees. These give you the option of quickly raising your workstation to alternate between standing and sitting during the day, which is also a great strategy for students. (If you don’t have the fancy equipment, you can approximate the same thing by working on a laptop or tablet and moving it to a counter for part of your day.) Another option is swapping that chair for a stability ball. Okay, you may feel funny sitting on a ball all day, but some people swear by it. Bonus: Sitting on these balls has the hidden benefit of strengthening your core, says Selen Razon, an assistant professor of sport and exercise psychology at Ball State University in Indiana. Take a “move more” break. 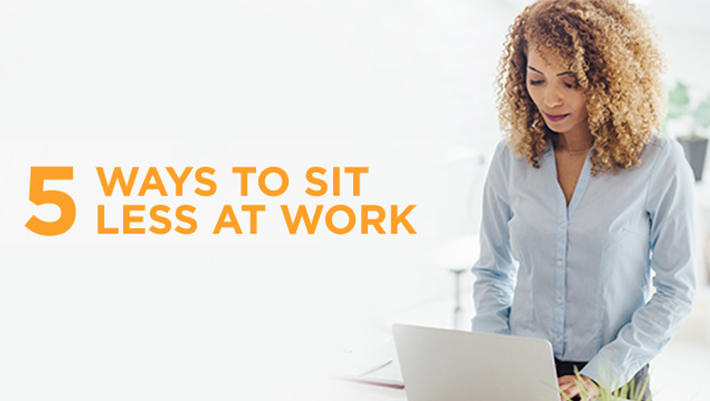 If you’re seated, get out of your chair and take a short walk (to the watercooler, around the school library, down to the hospital cafeteria, or to the printer, or for a quick stroll around the building). But don’t just do it this hour; make a point to do this every hour, if possible. Razon says many people might need reminding initially so setting an alert on your computer or smartphone can help. For added motivation, pick up a pedometer or activity tracking device (like Fitbit) and challenge yourself to take at least 5,000 steps a day, building to 10,000 a day. Every step counts. Handle that conference call on a headset or speakerphone. As you chat, walk around your office (or if you’re at home chatting on your phone with friends, walk around the block as you do so). Some other suggestions: Forego the elevator for the stairs, walk a less direct route to the cafeteria or bathroom or stand at the back of the room during lectures and conferences. Just being creative like this and seeing where else you can add movement to your day can count as much as formal exercise, says Razon. 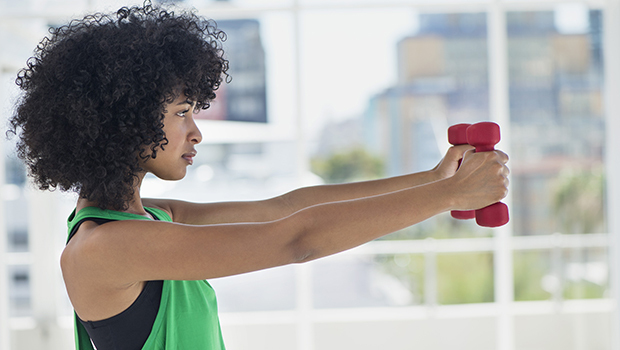 Fend off afternoon sleepies with fitness tools. Everybody’s energy dips in the afternoon. 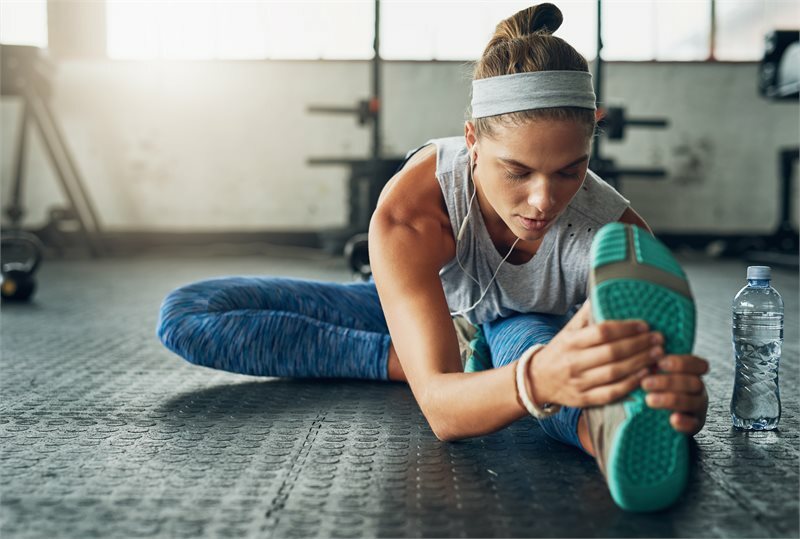 So fight the urge to put your head down by spending a minute or two using a foam roller or doing a few easy moves with a resistance band, both pieces of equipment you can stash in a desk drawer. These tools can even keep you active while you’re looking at your computer screen or talking on the phone, Razon says. Drink more water. Taking frequent sips will force you to get up more often, not only to refill your cup but also to go to the bathroom. Remember, more movement is good. Walk out the door. Yes, this may be a no-brainer, but skip any elevator or escalator and use those good old-fashioned stairs as you leave work or school. With leisure time coming, use the adrenaline you feel and walk it. Do all of these things—while eating mindfully—and you will likely find yourself healthier and happier. Best part? No gym required.